We’ve covered quite a lot this week already, so this final post is a bit more of a fun one. We’ll take a quick look at tools that let you aggregate and share information from other social media and online sources, starting with Storify. 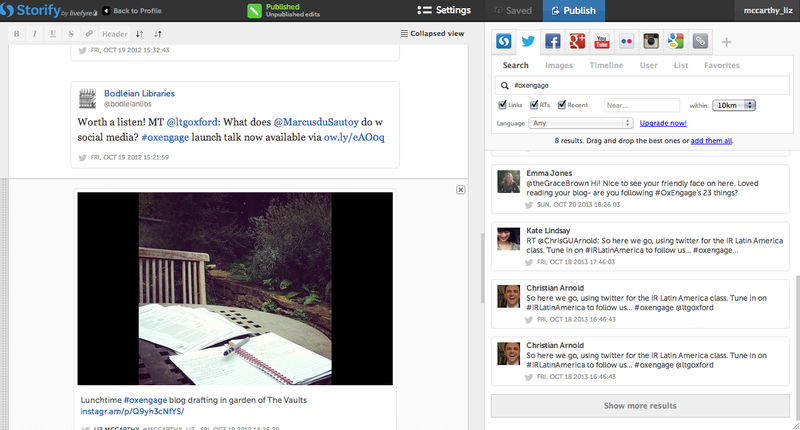 Storify is a way of bringing together content from across the web to create ‘social stories’, which you can then share. It’s an easy way to combine different media on a particular subject – say, a conference or an event – in a nice, embeddable format. As an example, here’s a Storify I made of last year’s 23 Things Twitter chat, which follows the online discussion through the various questions posed. You’ll see it includes blog posts as well as tweets, and I’ve annotated it with some notes and headings. Storify can pull information from news outlets, websites, Facebook, Instagram, YouTube and more. Take a look at the featured stories on the Storify homepage and see what it can do. You can sign into Storify using your Facebook or Twitter account (or your email if that’s easier). Once you’re signed in, it’s easy to get started. Use the button at the top to ‘Create a story’. You’ll be asked to add a title (‘headline’) and an optional description, then you can use the icons in the right-hand-side column to search various media (Twitter, Google, Facebook, etc.) for content. You can drag any items you want to include over onto your story on the left, and drag them around to reorder as you like (if you want more info, Storify provides detailed instructions). When you’re happy with what you’ve made, click ‘Publish’ (you can also save for later), and you’re done! You can get a link to embed your story on a website, share it via social media or email, or simply give others the link to visit. There are other tools that allow you to aggregate and publish information from various sources. Paper.li, for example, allows you to create online newspapers of stories and links (there’s a great quick guide on the paper.li website). Scoop.it allows you to do the same thing – see Scoop.it help for info). Spend some time exploring these tools and stories/papers generated by them. Compare them – can you see them being used for different purposes? Is one easier to read then the other? What might you use them for? Tag your post ‘Thing 9’. This entry was posted in Thing 9 and tagged Storify by Alasdair Watson. Bookmark the permalink.